When the first settlers from Europe arrived in the northeastern corner of what would is now the United States; they found the Native Americans using a brownish material as a flavoring and sweetener in their food and drink. The Indians taught them how to make this sugar from the sap of maple trees. The Indian method was to cut a slash or gouge through the bark of a maple and collect the sap as it oozed out. They used either boiling or repeated partial freezing of the sap to concentrate it. With partial freezing; the frozen part would contain no sugar and would be discarded. The remainder would be allowed to partially freeze again, and so on until only a thick, sweet liquid was left. They usually went on through the syrup stage to end with lumps of maple sugar; since this was easier to keep and handle. The settlers gradually adapted the Indian methods to their own technologies: boring holes in the trees and inserting wooden or metal spouts, using metal buckets to catch the sap, and using copper or iron kettles for boiling. The sap filled buckets were carried on a shoulder yoke to the spot where the syrup was to be made. The boiling was normally done out of doors; with the kettle hung over an open fire on a pole. This resulted in a product that was very dark, and partially flavored by the bark, ashes, etc. that made its way into the open kettle. It was still the normal practice to make sugar instead of syrup, for the same reasons as the Indians. Until the 1800's, maple sugar was the primary sugar in the United States. Only when the cane sugar industry began in the Caribbean Islands did cane sugar begin to replace it. Maple syrup and sugar became special delicacies, rather than staples. Maple sugaring in Vermont has a long history. In the early days, most of the production was by individuals for their own use, rather than as a business. Eventually, when it was no longer practical for every family to make their own syrup, individuals went into the business of making syrup to sell. 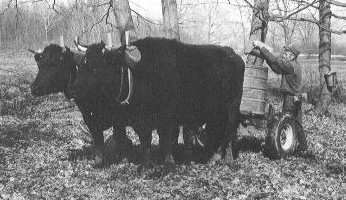 The sap was collected into large tanks on sleds or wagons drawn by oxen or horses. Buildings, called sugar houses, were erected to house the boiling process. The evaporator pan was invented, allowing more control of the quality of the process. Today, plastic pipes conduct the sap from the trees to a central tank. From there it is trucked to the sugar house.